St. Gregory (c.540-604), known as 'The Great', was pope from 590-604 and responsible for sending St. Augustine to convert England to Christianity in 597. 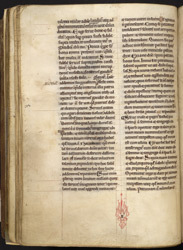 His writings were of fundamental importance to the medieval Church; this manuscript contains a copy of his homilies (sermons) on the Gospels. It was originally owned by Caerleon (afterwards Llantarnam) Abbey, in Monmouthshire, but was given in 1248 to another Cistercian house, Hailes Abbey in Gloucestershire, at the request of Richard, Earl of Cornwall (brother of Henry III) who had founded Hailes Abbey two years earlier, in 1246. Although neatly written, this manuscript has relatively restrained decoration (as was appropriate for a Cistercian book); it is therefore a little surprising to find minor details such as a quire signature embellished with colour ornament.